Special Cranes for Special Needs | EMH, Inc.
Often there is a need for special cranes as what’s “off the shelf” does not fully fit your needs. 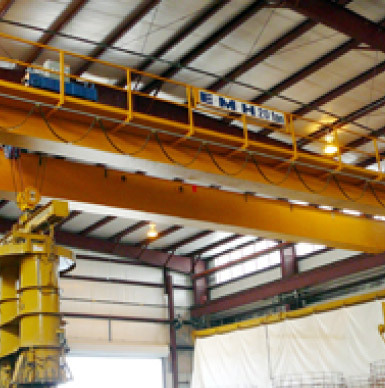 EMH will take your needs and employ the development of a special crane specifically designed for your needs. We develop special cranes in all categories including jib, gantry, and overhead. A special crane can be the key to a more effective manufacturing process for you and yield significant benefits. Just a few ways job cranes can be modified as special cranes is that they can be used for difficult material transport jobs, as magnet cranes, power plant cranes, and loading cranes. Special cranes can be used as robotic cranes in mining operations. You can rest assured that our engineers will help you develop the right special crane for your needs.